The "Gormok oneshots a blue tank" idea is an M&S wishful thinking based on "what I'm too dumb to do is impossible to do". While they accept that some "lower tier" content that "does not matter" may can be done in blues, but the "real game" needs what they have (gear) and not what they don't (skill). The logs prove that poor Gormok was oneshotted. The tank HP was never low. It's not magic guys, it's just the "no-lifer" ability to switch to Snobold Wassals. First of course we went to Ulduar, 3 shotted Mimiron (one try missing since I forgot to switch log on). The first try failed because the bots made some massacre, the second failed due to trigger happy melee killing the bottom part. My unusually high damage taken came from being head tank (and the logs still don't show my elemental). Vezax two shotted, wasn't hard at all. Then came Yogg + 3 (Mimiron stays out). Lot of people did it the first time (I think most of our members are not in HC guilds, but in casual ones, wanting more than boosting tards in ICC 4/12). On the fourth try we got P2 without a single extra add. Since only 1 person out of 4 jumped into the portal and it was 21:40, I thought we are way too tired for Yogg. So we went and oneshotted Gormok and friends. Next week we go and clear ToC at least up to 4/5. 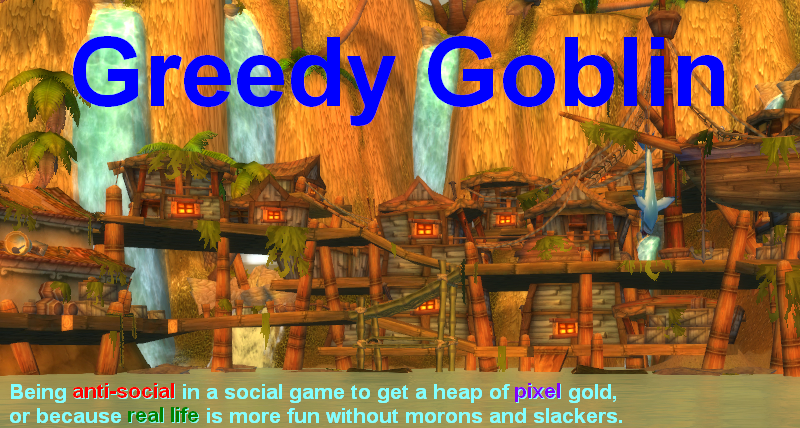 If there are as many people online as this time, just to annoy the M&S naysayers, we'll kill Gormok25 too. I'm certain that the beasts were the bottleneck for ToC. Them killed means everything killed in ToC. I'm still claiming that Gormok 25 is a mathematical impossibility, unless you bring along 5-6 tanks so you don't get more than 2 stacks of impale. You like to have logs for fights, regularly apologising for not having the logging enabled. I suggest considering Loggerhead. When first you enter a zone/instance, it asks you whether or not to enable combat logging, and remembers your settings. Seeing how easily the beasts went down in 10 man, I have no doubt that downing them in 25-man is also very doable, even with just 3 tanks. Hand of protection and some defensive cooldowns would take care of the impales. Have you done the maths on the DPS output of your blue-geared DPS on tank & spank fights, and verified that you can meet the requirements on e.g. Festergut? 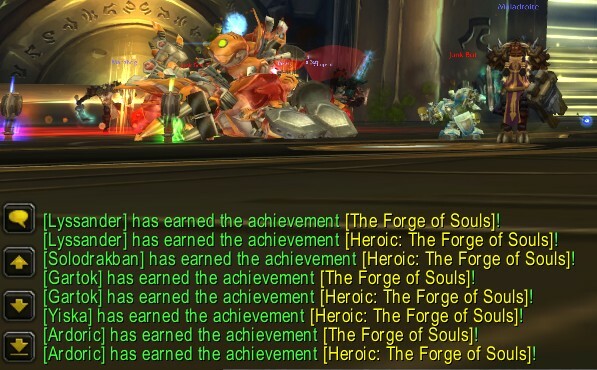 I actually am in a semi-HC guild as most would put it (9/12 HM ICC25 atm, and 11/12 HM ICC10), but I just skipped most of Ulduar due to personal reasons. Killed yogg on 25 once, and that's it (as ranged). Considering that a role change on yogg means a pretty big change in what you do, it feels like doing it for the first time again yeah. @Andru, I believe you are right. Toc10 is a pushover, and I'm sure we'll clear that place. Only slight problem might be Anub phase 3, but I haven't done the math. From the DPS numbers I've seen, it won't be an issue, since we outdps the freeloot t10 tards. @Andru: so it is a mathematical impossibility if you follow the same strategy as a 'properly' geared team? Of course they need to derive their own strategy and raid composition, that is an essential part of Gevlon's point with this project: That if a team actually spends the time to think and plan for themselves instead of expecting to steamroll everything then they can complete the content, regardless of gear. No you didn't say anything, 'Andru'. First posts were mine, last wasn't. Quit masquerading as me, you impersonator. My account is dated march 2009, yours is dated 2010 so stop pretending being someone you're not. Techically, you're right, however, Gevlon's guild seems to have tank attendance issue as is. Platewearers with enough defense to be uncrittable, and able to hit a taunt rotation and soak an impale or two, no, that's not a problem. Fake Andru deleted. If one has blogger profile, I can delete the troll. About Gormok-25: make a disarm / dismantle rotation (need at least three, four for more security) and Gormok will never ever impale. Why are you still raiding ToC? Raiding ICC would make some noise in the forums. Btw, are you publicizing this anywhere? "just to annoy the M&S naysayers"
It would be very interesting to see this group try LK at some point. The buffs to the zone over the next few months will make the instance easier, but I think several of the bosses will still be unpuggable for the 'average' player who has a difficult time with not standing in things. A blue group smashing through would certainly make waves! But, excellent work and I wish you the best of luck in your experiment. I just wanted to say grats. I didn't put much faith in the oneshot a blue tank, I did expect a few 2 shots (so it felt like 1 shot). Mostly because I was in a guild that was geared and had that issue. Don't bother with beasts 25. 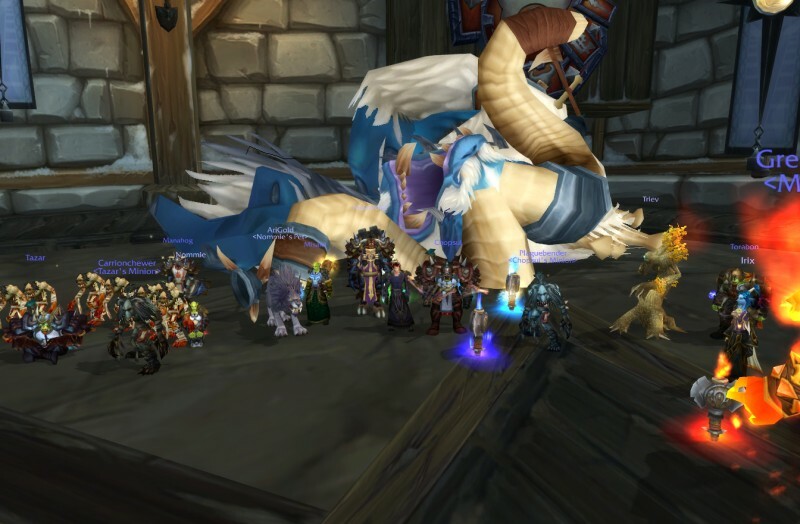 My guild is a pretty good 10 strict guild (world #11 LK kill) and we figured that we could steamroll beasts 25 for laughs. Unfortunately even with 13 people and a 3 tank/3 healer/7 dps setup we could not make the berserk timer. Granted that was in 219/232 gear and we could manage it now easily but in blues you will just die to berserk. If you do manage to bring 15+ people you would certainly have a shot at it though with solid play but the berserk timer on that fight (unlike sartharion, say) is actually a thing when you are severely undermanned. Normally I don't make a comment without having something to add to the discussion, but I just have to congratulate you. Very impressive Gevlon, keep up the good work. Looking forward to seeing a screen of Anub dead quite soon. It's interesting, and I am curious to see how far this goes. However, since a few people asked, I'll say again: If you take the dps shown in these logs for straight-up fights, multiply by 130%, and compare to what is needed to beat Festergut, it comes up short. There's only so much damage you can squeeze out of blue gear, and it just ain't enough. Gevlon is well aware of this, and his response is that Blizzard will nerf ICC even more than the 30% in the pipeline. Since the 30% won't kick in until late July (one bump every four weeks looks to be consistent), this nerf he is counting on probably won't appear before late August, if ever. A tip. Stack priests and paladins for the 25 man blue versions. Rotations will keep the tanks alive if needed. Was this on normal or heroic mode? I guess it might be obvious to long time readers, but I'm curious. It's still an accomplishment in any case, and not one that's ever been duplicated to my knowledge. You deserve to feel good about it, however if it was normal mode I don't think it's as impressive as it might be. After all, it's not like Northrend Beasts has ever been nerfed and the M&S has been pugging it on normal since they were released on many servers. If it was heroic on the other hand then that's fantastic, and leads to the possibility of something incredible. Even without beating the Lich King you could still make a hell of a splash if you managed to get a Tribute to Dedicated Insanity in blues. @last anon: normal obviously, 232 content in 200 blues is pretty heroic anyway. @Gevlon: getting the Biests down meant 5/5 success in every random raid I ever participated there. So please don't stop at 4/5. Anubs adds can still be stunned, i suggest taking at least one retribution paladin for the endboss. Rets also offer good cleave damage. Holy paladins can also stun adds. If push comes to shove you can deliberatly let the adds submerge to burn down the last percents. I don't think that adds will be a problem on anub. They are stunable and they do not spawn in phase 3 on normal mode. So maybe some good timing when to push for phase 3, some tank swap between MT stuns unless our healers run out of mana we will kill him. As far as judging if you are able to pass Festergut in Icc-10/25, using northrend beasts or icehowl is a bad idea. A much better fight to compare is on the log however, General Vezax. The overall dps on that kill was 18989. Icc buff would put that around 21838. You have 300 seconds to remove 9,412,875 HP. The 21838 would put you at 431 seconds, so yes, that's over enrage. Without buff, they need another 8kish total. However, at the 20% buff, they'd only need 6112 more DPS. By using say, a bear, as an off-tank that could put a big chunk by going cat to capitalize on the damage debuff. I think this is actually quite feasible even now even with 15%. At 20%, I have full confidence in them hitting a raid dps of 25101 in Icc 10, as well as a good bit of confidence they could hit 26670 at 15%. @ Fizzle, having a bear tank first and then get salv from the paladin tank once they have 9 stacks of the debuff, allowing them to go kitty and DPS is a something my guild does, and it really helps DPS.